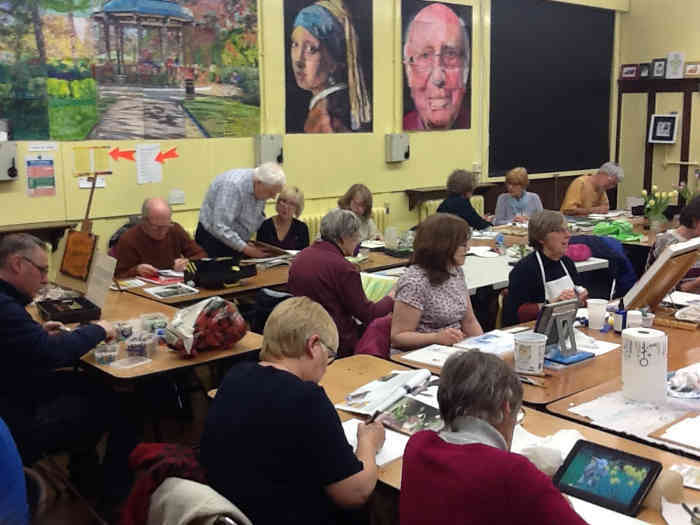 Every two weeks or so we have a themed evening where one of our members organises perhaps a still life, a look at a particular artist's work, a technique such as acrylics, pastels, collage, etching, drawing etc. All themed evenings are voluntary so that you can choose to do your own work if the theme isn't of interest to you. In the alternate weeks marked "General" in the programme you can do your own work or continue the previous week's theme. We bring our own materials to the club each week. Everyone in our group is encouraged to relax and work at their own pace - there is no pressure to compete with others, and we have a wide range of abilities and skills within the group. We don't offer tuition, but friendly advice is always available. Our programme every year includes an informal “Competition Evening” when we will exhibit in a room at the Strutts and invite artists from other local clubs to come and vote for their favourite pictures in various categories. This is a fun event and a good chance to meet other artists from our area, have a drink and a chat. 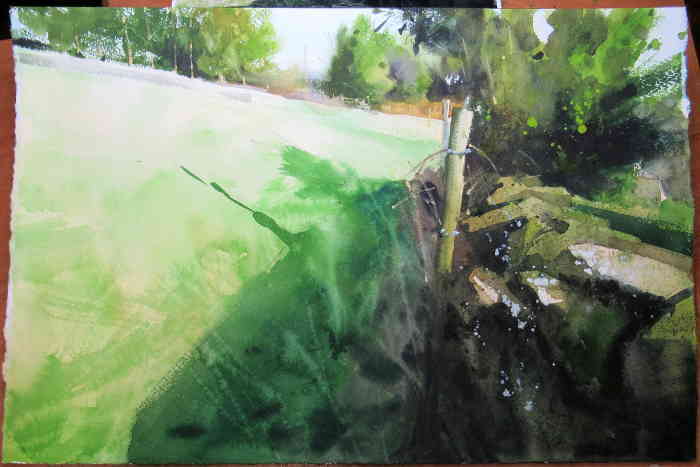 We generally also hold a week long exhibition at the Gallery at Cromford Mill in the summer. As a way to illustrate how diverse our group is here is a picture of Steve ‘just a member’ proudly kneeling in front of his latest piece, a mosaic mirror frame. However, Steve does not just do mosaics he also does Lino-Cuts and paints. I have never sat and watched someone paint with Oils before, it's different. Something you thought was set in stone suddenly moves, smears, transforms. Susan is a quiet spoken, I suspect modest, person who lit up the room with her demo. The painting although not finished is vibrant and full of interest, from a slightly run of the mill photograph to a wonderful painting in two hours. She works from the idea, through sketches to a monochrome under painting, in what seemed like a few moments. Yes, she did cheat in this case, for the sake of the demo but wouldn't you. The sketches and the ideas were already there but the process is fluid and from her own words, periodically she does things differently. So no fixed pattern here and then into the paint. A limited pallet but lots of paint going from a course outline blocked in with bold pallet knife strokes to finer and finer detail. Still with the pallet knife until finally the deepest detail is added with the pallet knife or brush as best suits the picture. I'm note sure I will ever paint with oils but one thing for sure I will not look on with suspicion from now on. the bit we all want to see is as he acknowledges different from those painted by most, with a strong feature of the wall in the foreground running into the picture. We all watched with great interest as until the very late stage it was not clear how the two halves of the picture left and right of the post would merge. However, once the shadows went in the two parts became one and the picture was complete. 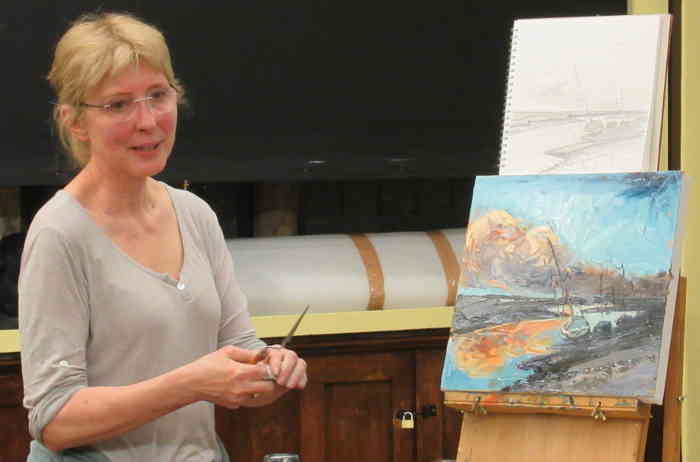 Periodically, we have an artist come in and give us a demonstration the latest of these was Jenny Aitken. 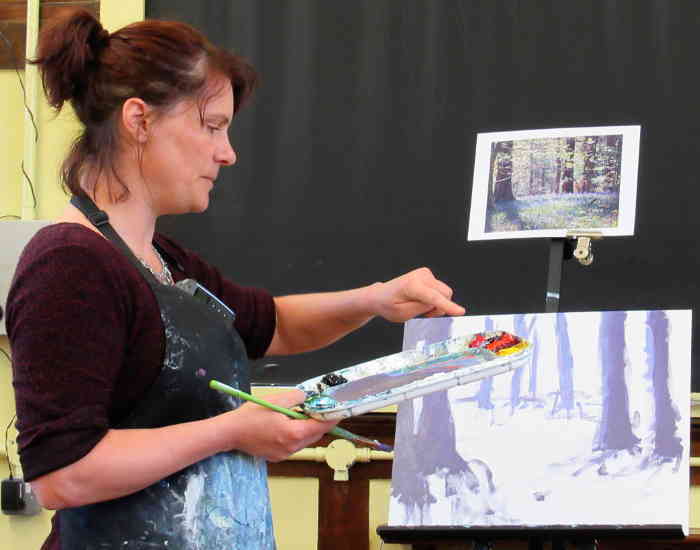 Jenny demoed two pictures in Acrylics in under two hours. Enthusiastic, entertaining, enlightening are all accolades I could apply to Jenny but I think the best I can say is the two pictures looked as if they glowed with the light she talks about. I don't normally work quite this quickly she relied, with a smile that was as quick to arrive as the brushstrokes, when asked about the speed with which she produced the pictures. Having watched I'll bet it's not a lot slower, I loved it, go have a look at her pictures. Catherine Inglis Fine Artist definite deserves that accolade. 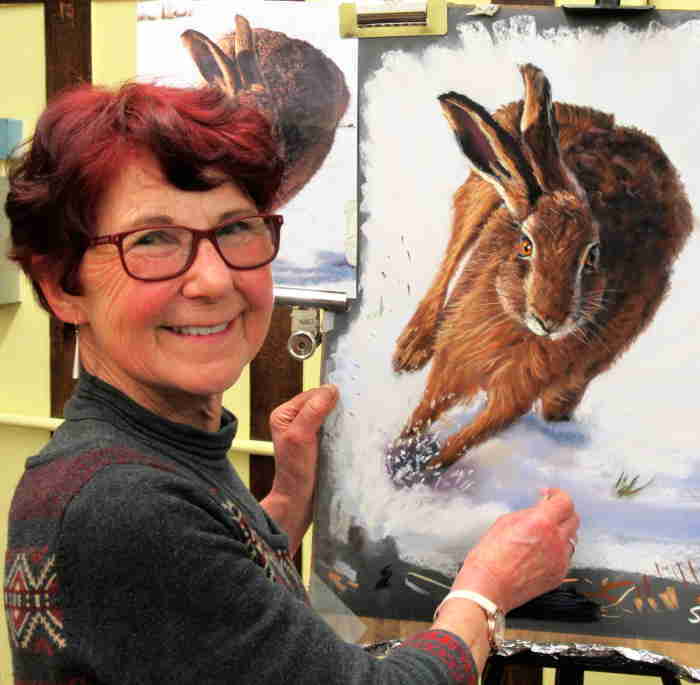 Within a few moments of starting she had a likeness for the Hare down and was starting to tell us all about how she works. By the end of the two hours we were all laughing and full of admiration for a great artist. I can only describe her as down to earth and wonderful. Dave Woolass came in a little while ago and gave us a fascinating demonstration of “Watercolours”. 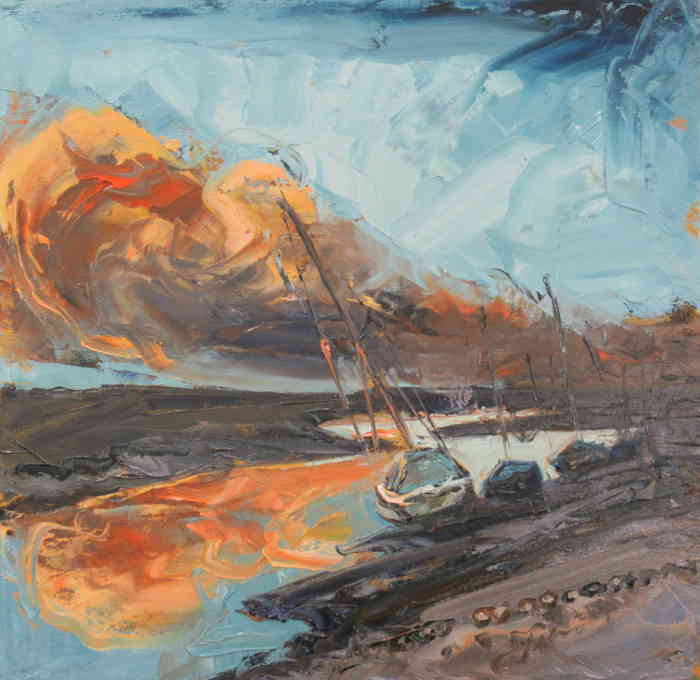 Interestingly his definition of watercolour is any paint that can be worked in the same way as watercolours with water. So it would include the transparent Acrylic Inks and Paints. 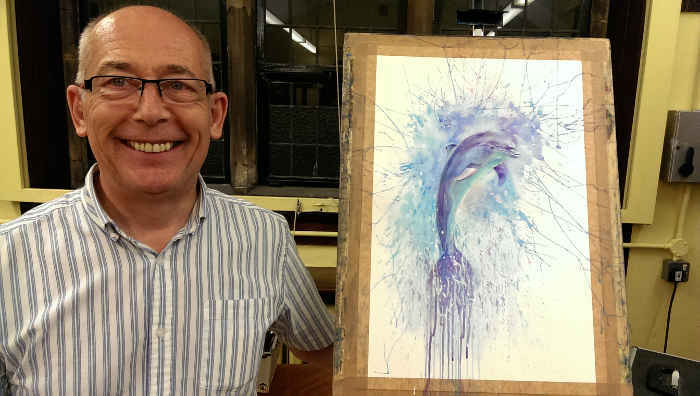 Considering the way he works with thin layers and lots of water it is remarkable that produced the dolphin picture in about two hours. He also said despite the fact that he often paints the same pictrue again this was the first time he had done this painting. A very interesting man and demonstration. 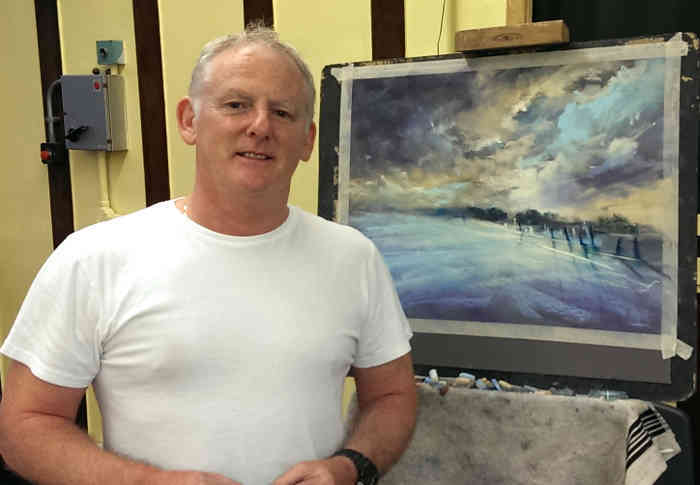 Periodically, we have an artist come in and give us a demonstration and a recent visitor was Les Darlow who came in and gave us a fascinating demonstration of Pastels. Personally I don't get on with pastels however to see someone produce such vibrant and instantly lovable pictures with a few deft strokes was a revelation, I shall have to try again! Finnally, thanks to all our members old and new who have consented to let us publish there pictures here, warts and all, so that you can get an idea of the open way we operate.